Today’s question comes from one of our readers who is currently 8 months pregnant: Should you wrap, bind, or splint your belly back together after pregnancy? Wrapping the belly after childbirth is an ancient practice in some cultures. In recent years, it’s really taken off among new moms hoping to get their flat belly back after pregnancy. But, is it really effective? During the very early postpartum period (first 6 to 8 weeks after birth) it can definitely be a very helpful practice to support the lower back and help to shrink the uterus before you’re able to exercise. Once you’re past this early postpartum phase, research has NOT shown binding to be an effective method of retraining the core muscles and losing the “mummy tummy”. The only way a group of muscles is going to get stronger is through proper training, not binding. Think of it this way – if you were to wear a splint on your leg, do you think the muscles would get stronger or weaker in the area you splinted? They’d get weaker, and in addition to that, the muscles around the area splinted would begin to compensate for the muscles that aren’t being used due to the splint. What does that mean for your core? Added pressure on your pelvic floor muscles and diaphragm. This is why, over the long term, some women find it more difficult to breathe and also why they start to experience more urinary incontinence when wearing a belly wrap. Wearing a splint or wrap doesn’t improve the postural compensations caused by pregnancy (or the reason for the lower back pain and protruding belly). Yes, a splint can improve your posture, but ONLY when you’re wearing it (it’s just symptom relief). I’m sure you don’t want to be wearing it forever! You want your core to be strong so you don’t need a splint! 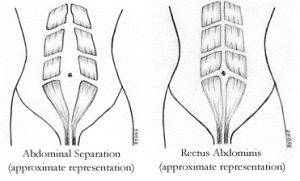 So, if belly binding hasn’t been found to be effective at improving the gap in belly caused by pregnancy, what CAN I DO? First, start with diastasis recti safe exercises. This means don’t place any added pressure on the abdomen while you’re reconnecting with your core muscles. AVOID: planks, sit-ups, leg lifts, piking up from a laying down to a seated position, and yoga backbends. FOCUS: core exercises that focus on strengthening the transverse abdominal muscles, reintegrating the connection between the core and pelvic floor muscles, and that don’t place added pressure on the abdomen. A great place to start is transverse abdominal contractions combined with kegels. Once you begin to feel that connection to your deep core muscles again, these exercises can be built upon to continue to strengthen the core and pelvic floor. A strong core and pelvic floor will improve postural compensations caused by pregnancy, strengthen and tighten the belly, and improve incontinence and diastasis recti issues.